"SAFE SIX LEVERS". 3 1/16" high x 2" wide x 7/16" deep. Stamped steel case. Steel shackle. Post key. "SAFE SIX LEVERS". 3 1/8" high x 2" wide x 7/16" deep. Stamped steel case. Steel shackle. Post key. "SARGENT SIX LEVER". 3" high x 2" wide. Stamped steel case. Steel shackle. Post key. Chain lock. Mfg by: Sargent & Co. US Patent #D65529. "SARGENT SIX LEVER". 3" high x 2" wide x 7/16" deep. Stamped steel case. Steel shackle. Post key. Mfg by: Sargent & Co.
"SARGENT SIX LEVER MADE IN U.S.A.". 3 1/16" high x 2" wide x 7/16" deep. Stamped steel case. Steel shackle. Flat split key. Mfg by: Sargent & Co.
"SBHCo SIX LEVER". 3 1/8" high x 2" wide x 7/16" deep. Stamped steel case. Steel shackle. Post key. "SUPPLEE_BIDDLE HDW. CO." is stamped on the obverse of the shackle. "SECURE LEVER". 3 1/16" high x 2" wide x 3/8" deep. Stamped steel case. Steel shackle. Flat split key. "SEGAL SIX LEVER". 3 1/8" high x 2" wide x 7/16" deep. Stamped steel case. Steel shackle. Post key. 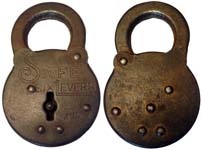 Mfg by: Segal Metal Products Co.
"SHAPLEIGH SIX LEVER". 2" wide. Stamped steel case. Steel shackle. Post key. Made for: Shapleigh Hardware Co.
"SIX LEVER". 2 1/4" high x 1 1/2" wide x 5/16" deep. Stamped steel case. Steel shackle. Post key. "SIX LEVER". 3" high x 2" wide x 1/2" deep. Stamped steel case. Steel shackle. Post key. Mfg by: Corbin Cabinet Lock Co.
"SIX LEVERS" - Brass. 3 1/8" high x 2" wide x 7/16" deep. Stamped brass case. Brass shackle. Post key. "SIX LEVERS" - Steel. 2 7/8" high x 2" wide x 7/16" deep. Stamped steel case. Steel shackle. Post key. "SNAP SIX LEVER". 3" high x 2" wide x 3/8" deep. Stamped steel case. Steel shackle. Post key. "S.P.CO.". 3" high x 2" wide x 1/2" deep. Stamped steel case. Steel shackle. Post key. "S.P.CO." is stamped on the dust guard. Made for: Southern Pacific Railroad Co.
"SPECIAL SIX LEVER". 2" wide. Stamped steel case. Steel shackle. Post key. 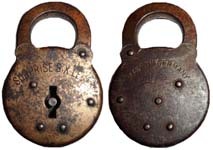 Mfg by: Eagle Lock Co.
"SPECIAL SIX LEVER". 2" wide. Stamped steel case. Steel shackle. Flat split key. 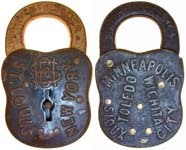 Mfg by: Eagle Lock Co.
"ST. LOUIS NEW YORK - SHCo - MINNEAPOLIS SIOUX CITY TOLEDO WICHITA". 3 1/2" high x 2 1/8" wide x 1/2" deep. Stamped steel case. Steel shackle. Post key. Made for: Simmons Hardware Co. Mfg by: Slaymaker. 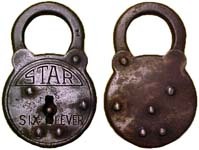 "STEEL STATE SIX LEVER". 3 1/16" high x 2" wide x 7/16" deep. Stamped steel case. Brass shackle. Post key. "SLAYMAKER LANCASTER P.A." is stamped on the obverse of the shackle. 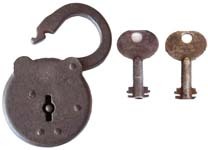 Some locks have a plain shackle. Mfg by: Slaymaker. "STEEL STATE SIX LEVER". 3" high x 2" wide x 3/8" deep. Stamped steel case. Steel shackle. Post key. Mfg by: Slaymaker. "STERLING LOGAN-GREGG HARDWARE CO. SIX LEVER". 2" wide. Stamped steel case. Steel shackle. Post key. "PATENTED JUNE 16, 1914" is stamped on the reverse of the case. 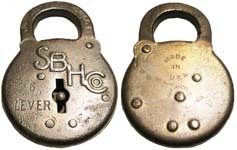 Made for Logan-Gregg Hardware Co. Mfg by: Eagle Lock Co. James J. Murphy Patent # 1100391. "STRONG LEVER". 2" wide. Stamped steel case. Steel shackle. Post key. "SUPER LEVER". 3" high x 2" wide x 7/16" deep. Stamped steel case. Steel shackle. Post key. "SUPREME SIX-LEVER". 3 1/16" high x 2 1/16" wide x 9/16" deep. Stamped steel case. Steel shackle. The reverse of the lock is blank.